Carole Boston Weatherford is an award-winning nonfiction children's book author. Her books have received numerous accolades, including a Caldecott Honor for Moses: When Harriet Tubman Led Her People to Freedom and a Coretta Scott King Award Honor for Becoming Billie Holiday, as well as the NAACP’s Image Award. She is currently a professor and Director of Professional Writing at Fayetteville State University in North Carolina. You can find more about Carole at cbweatherford.com. R. Gregory Christie is a three-time recipient of a Coretta Scott King Award Honor for illustration (Brothers in Hope: The Story of the Lost Boys of Sudan; Only Passing Through: The Story of Sojourner Truth; The Palm of My Heart: Poetry by African American Children), a two-time winner of the New York Times’ 1 Best Illustrated Children’s Books of the Year (in 2 for Only Passing Through and in 22 for Stars in the Darkness), a honor winner of the Theodor Seuss Geisel Award for illustration (Jazz Baby), and a recipient of the NAACP’s Image Award. He operates GAS-ART GIFTS, a children’s bookstore with autographed copies in Decatur, Georgia. You can find more about Greg online at gas-art.com. Gr 1-3 This vibrant picture book examines Congo Square in New Orleans. A foreword and author's note explain how, historically, slaves in Louisiana were allowed Sunday afternoons off. This custom continued after the territory joined the United States, although in time, New Orleans established one location for all slaves to gather: an area that became known as Congo Square. This unique practice helped enslaved and free Africans maintain cultural traditions. The impact was felt far beyond New Orleans as musicians, dancers, and singers developed, explored, and shared rhythms that eventually grew into jazz music. The text is realistic but child appropriate. Couplets count down the days to Sunday in a conversational tone ("Slavery was no ways fair./Six more days to Congo Square."). The writing is accompanied by folk art style illustrations, with paint applied in thick layers. Some images, such as faces, are more detailed, while others are presented as silhouettes. Collage with painted elements is incorporated on occasion. The architecture portrayed evokes the New Orleans setting. Bright colors suggest the exuberance displayed at Congo Square. Spreads where the slaves are finally able to sing, dance, and express emotion contrast effectively with the forced restraint of those depicting the work week. VERDICT: Unique in its subject and artistic expression, this beautiful book belongs in most collections. In historic Louisiana, enslaved Africans were provided a half-day of rest each Sunday, and in New Orleans their official and legal gathering place was Congo Square. With two spare couplets for each day of the week, Weatherford tells readers what slavery looks like. The verses count down to Sunday: "Mondays, there were hogs to slop, / mules to train, and logs to chop. / Slavery was no ways fair. Six more days to Congo Square." A slow, steady rhythm builds as the many labors and horrors ("the dreaded lash, too much to bear") of enslaved people are described. Weatherford sugarcoats nothing, but because of the poetic form, the text is not mired in sadness or pain; Weatherford just respectfully and soberly acknowledges it throughout. Christie's illustrations, whose colors and components recall the work of Jacob Lawrence, add even more emotional depth. Though most of the faces are featureless, Christie's use of sharp angles in the slaves' bodies as he depicts their back-breaking work evinces their ever-present emotional and physical suffering. When they reach Congo Square, though, the figures elongate and have softer curves and angles, allowing them to relax and to dance; they leap as high as Weatherford's joyful verse. Weatherford's foreword provides historical context for the real place the book describes. Coretta Scott King Honorees Weatherford and Christie have created a gorgeously artistic and poetic homage to the birthplace of jazz and a people whose legacy is too often ignored. For one day a week, the slaves of New Orleans were allowed by law to gather on one public space: Congo Square. Through sparse, deliberate language, Weatherford tangibly captures the anticipation of those Sundays, listing the physical and emotional work that slaves endured without respite. They tend to animals and crops, cater to their masters, endure losses and lashings, all the while counting the hours until they can revel in the freedom of Congo Square. Holding on to that joyful experience feels like a form of silent resistance as the slaves bear the harshness of the week. The blunt words are richly supplemented by illustrations reminiscent of Jacob Lawrence's work. Christie elegantly renders people's gestures in chalk, capturing their energy or lack of, depending on the context. Blocks of color stamped with texture bring to life the landscape and movement in a place where "They rejoiced as if they had no cares; / half day, half free in Congo Square." Subtle and layered, this is an important story beautifully told. 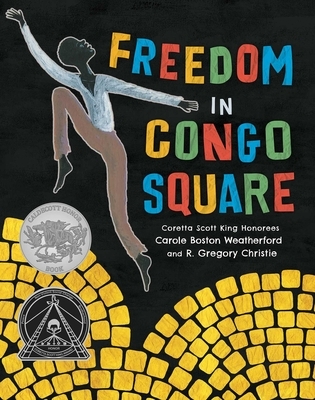 &lt;i&gt;Freedom in Congo Square&lt;/i&gt; is a graceful, gorgeous picture book that honors this Louisiana gathering spot, now on the National Register of Historic Places. Caldecott Honor author Carole Boston Weatherford (&lt;i&gt;Moses: When Harriet Tubman Led Her People to Freedom&lt;/i&gt;) calls this landmark "freedom's heart." As her author's note states, "Congo Square is now part of Louis Armstrong Park, which is named after the jazz great and New Orleans native. That is fitting since jazz... evolved from the African rhythms kept alive in Congo Square." A glossary and a dense but accessible two-page foreword further contextualize the book, which on its own is a rhythmic countdown of hardworking slaves looking forward to a celebratory Sunday off in Congo Square. The chanting rhyme begins: "Mondays, there were hogs to slop,/ mules to train, and logs to chop./ Slavery was no ways fair./ Six more days to Congo Square./ Tuesdays, there were cows to feed,/ fields to plow, and rows to seed./ A moment without work was rare./ Five more days to Congo Square." In his bold, folk-art style, Caldecott Honor artist R. Gregory Christie (&lt;i&gt;The Palm of My Heart&lt;/i&gt;; &lt;i&gt;Brothers in Hope&lt;/i&gt;) paints slaves toiling in surreal fieldscapes in lush persimmons and yellow-golds, plowing, hanging clothes, picking cotton--then expressively dancing, swirling and playing music on their much-anticipated Sundays. This is a powerful testimony to the resilience of the human spirit and a fine conversation starter. Located in what is now the Treme neighborhood, Congo Square was the one place where the slaves and free blacks of New Orleans were allowed to gather on Sundays, a legally mandated day of rest. There they could reconnect with the dance and music of their West and Central African heritages and feel, at least for a few hours, that they were in "a world apart," where "freedom's heart" prevailed. Weatherford hits a few flat notes with her rhyming ("Slaves had off one afternoon,/ when the law allowed them to commune"), but she succeeds in evoking a world where prospect of Sunday becomes a way to withstand relentless toil and oppression: "Wednesday, there were beds to make/ silver to shine, and bread to bake./ The dreaded lash, too much to bear./ Four more days to Congo Square." Christie, who worked with Weatherford to illuminate another historic neighborhood in Sugar Hill (2014), takes readers on a visual journey, moving from searing naïf scenes of plantation life to exuberantly expressionistic and abstract images filled with joyous, soaring curvilinear figures. An introduction and afterword provide further historic detail.